These were not painted on paper or cloth….these intricate patterns were not designed in computer – all these were crafted in stone some 400 years back. Welcome to the stunning jewel box of Agra, welcome to Itimad-ud-daula, which you ignored last time you went to the erstwhile Mughal capital. Completed approximately three decades before the greatest monument of love, the tomb of Itimad-ud-daula is a breath- taking tribute to the first family of Mughal servants. And it was erected by the most famous lady in the history of Mughal dynasty – Nur Jahan. It stands as a testimony to the family’s standing and also as a turning point in the evolution of Mughal architecture, which culminates at Taj, hardly a few miles away on the other bank of the river Yamuna. Hidden behind these incredibly beautiful designs are unseen forces of this subcontinent’s history and an unparallel story of love and intrigue. The story starts with an Iranian nobleman Khwaja Ghiyas Beg, who came to India on a fortune hunt. Ghiyas Beg’s father was a prime minister at Khorasan but cruel turn of fate forced him to abandon his homeland and flee towards the Mughal court in search of employment. His daughter Mehrunissa was born at a particularly difficult period during the arduous journey near Kandahar (1577). Her parents – under dire clutches of circumstance – were forced to abandon the baby. A caravan of merchants coming behind them picked up the girl child and handed over to the distraught couple a few days later. It was the leader of that caravan, who took Ghiyas Beg under his care and introduced him at the court of Akbar. By dint of his sheer hard work and talent Khwaja Ghiyas Beg and then his son Asaf Khan rose very fast through the rank of Imperial hierarchy. In 1605, Ghiyas beg was given the title of Itimad-ud-daula (Pillar of the State) and promoted to the post of diwan by Jahangir. Meanwhile, at the age of 17, Mehrunissa was married to a middling Iranian noble Ali Quli Istajlu, Sher Afghan (reportedly the match was arranged by Akbar himself). Everyone at the darbar was much impressed with the sophistication and taste of this highly educated Iranian family but the real turn in family’s fortune came through this daughter. In 1611, Emperor Jahangir fell in love with Meherunissa – then a widow of around 35 – and immediately married her (Meherunissa became Jahangir’s 20th wife). Soon her father (who was recently caught in a bribery scam and also arrested for alleged links with Khusru) was made the Diwan and brother Asaf Khan was made Mir Bakshi (Imperial Pay master); Nur Jahan’s extended family also held the governorship in 7 out of 12 provinces– this concentration of power in the hands of a single family was not only unprecedented but also would not be replicated till the dying days of the Empire. Meherunissa accompanied Emperor Jahangir everywhere and was equally adept in horse riding and big game hunting apart from her highly sophisticated taste in culture. 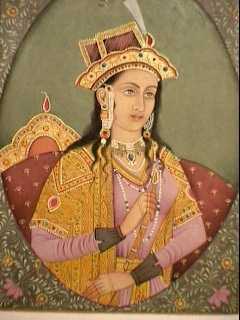 Jahangir (whose formal name was Nur-uddin) renamed her Nur Mahal (Light of the Palace) and then Nur Jahan (Light of the Universe) – the name in which she was to become famous for posterity. Nur Jahan’s daughter from her first marriage Ladli Begum was married to Jahangir’s son (from a concubine) Shahryar. Asaf Khan’s daughter Arjumand Bano Begum (future Mumtaj Mahal) was married to the most powerful of Jahangir’s sons, Prince Khurram. It has been alleged that this Nur Jahan Junta (Itimad-ud-daula, Asaf Khan, Khurram along with Nur Jahan) actually used to run the empire even as Jahangir went on increasing his daily intake of opium. Symbolically, the apogee came when Nur Jahan was portrayed alongside Jahangir in imperial gold coin (only instance during the entire Mughal history), implying that she was no longer a mere consort but a co-ruler. Nur Jahan started building the tomb of her father in 1622 at the height of her power and it was completed in 1628, shortly after Jahangir’s death and Nur Jahan’s fall from power. 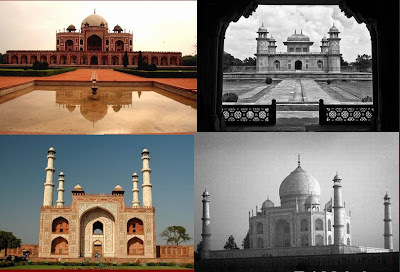 It represents a great transition in Mughal architecture from its first to second phase. From pre-Akbar days, Mughal buildings - both public and military buildings (like mosque or fort) and funerary buildings (more personal) were built in red sandstone. From the days of Humayun’s tomb (built by Humayun’s sister Gulbadan Begum), Mughal artisans specialized in marble inlay within sandstone panel. But it was at itimad-ud-daula, we see for the first time a complete mausoleum made of marble. Itimad-ud-daula is also significant for two more architectural trends, seen for the first time in Mughal buildings – pietra dura or large scale stone inlay using precious and semi-precious stones and chiaroscuro or the use of light and shadow technique. The tomb, which actually houses not only the mortal remains of Itimad-ud-daula but also his wife Asmat Begum and some of the other members of Nur Jahan’s family, including her daughter Ladli begum (also named Meherunissa). Situated on a rectangular plot right on the banks of the river, the complex has four huge gates, built of red sand stone but decorated with marble inlays much like Humayun’s tomb or Sikandra. Inside, the rectangular marble mausoleum is set amidst lush green Mughal cheher bagh. It is a single story structure with four minarets. But the base of the monument is still in sand stone. Perhaps it was kept lower deliberately – they were Royal servants but not the Imperial family. Someone like Nur Jahan would have been acutely aware of this difference in status. Even though at times it is called the baby Taj but what it lacks most is the symmetry of Taj. Over the structure’s flat roof rises a beautiful cupola, topped with foliated lotus like design. Inside the main hall lie the sarcophaguses of Nur Jahan’s parents in asymmetrical fashion. In rooms around the main hall other mazars are scattered (Nur Jahan herself is buried in a simple mausoleum at Shahdara Bagh in Lahore, next to Jahangir’s final resting place). The entire structure sits like a jewel box. Every side of the structure has three arched doorways with the middle one being the actual door. But the most impressive and elegant craftsmanship is to be seen on the panels and floors of the mausoleum. Pietra dura – which originated in the Roman E mpire and flourished in Italian cities like Florence in the 16th century, has sometimes been described as pittura per l’eternita or painting for eternity. It surely describes the panels and floors of Itimad-ud-daula best. But the central Asian or Iranian stone inlay work was somewhat different from the European tradition as could be seen from the stunning Lotfallah mosque or other buildings at Nasq-e-Jahan square at new Safavid capital Isfahan(built in late 16th century). Surely the craftsmen for Itimad-ud-daula came from outside India. The family’s Persian connection was perhaps directly responsible for that. Mughals began like titans and finished like jewelers – this is an oft-quoted statement, but the finish would not have come without the infusion of this Persian sophistication. The other design trait or using extensive stone jali (screen) also started with this tomb. Inside the mausoleum, as the sunlight seeps in intricate pattern through this beautifully carved screens and falls on tiles of geometric design, it creates a serenely different world altogether. 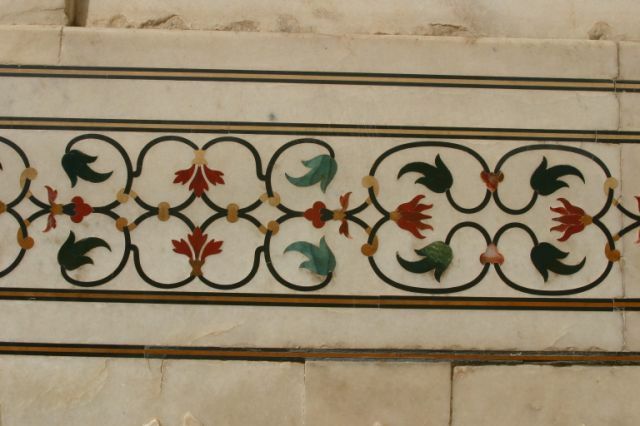 Both the craft heritage of pietra dura and chiaroscuro would be carried much further in Taj and royal buildings inside Lal Quilla and Agra Fort during Shah Jahan (Prince Khurram)’s time. His master builders had more confidence in using marble for the entire building, even at the base. But the sheer elegance of this first experiment provides the most beautiful interlude in the annals of Mughal architecture. Eventually Khurram and Nur Jahan fell over and Khurram rebelled against his own father. Even though the rebellion was controlled, Jahangir died in 1627 and Khurram – with the help of his father-in-law and Nur Jahan’s brother Asaf Khan – easily triumphed over Nur Jahan’s choice Shahryar (her son-in-law). But the former partners reached an agreement. Nur Jahan withdrew from public life, dedicated herself to building the mausoleum at Lahore and to the art of perfumery, which she learned from her mother (according to Indian tradition, it was her mother, who invented rose ittar). Even amidst the clutter and congestion of today’s Agra once you are inside Itimad-ud-daula complex, the fragrance of her taste wafts through the morning mist set over the dying river. Fascinating. Thank you for sharing this nicely written and informative piece.